I have a new blog over at http://www.particularcreations.com. Feel free to go there to follow me and my creative endeavours. I once heard a small child tell her Mom that one of her friends at pre-school came from a “divorced family”. Her innocent and earnest understanding of family was very simple: there are parents (sometimes only one, sometimes a Mommy and a Daddy, and sometimes two Mommies or two Daddies) and there are siblings. Siblings could be older or younger (by just a little or even by quite a lot), and they could even not look at all like you or your Mommy or Daddy. Sometimes your brother or sister came from a special place where children and babies didn’t have a forever family, and Mommies and/or Daddies chose them specially to be part of your family. She had a simple understanding that family was somehow married or divorced as a unit. It is often in these simplified childlike understandings that the truth of things can be found. During the last two weeks I have been privileged to experience family again in its best form – my Mom passed away two weeks ago, and it was her memorial services yesterday. My hubby and I often debate topics, trying to unpack their meaning, the pros and cons of something, their truth or philosophical meaning, and we often disagree based purely on our different experiences of that topic. For him, “family” is almost the lowest rank in his friendship hierarchy. I have been extremely lucky in so many respects, and I have come to see more and more, extra-specially when it comes to family. For me, if someone is a family member it means you can rely on them when the chips are down, you can always expect some kind of help or assistance (even if it is just a kind word of encouragement, a meal, and a warm place to sleep if you are down on your luck). Family means that you have network of people who actively wish you well, who are rooting for you, and who are on your side. Don’t get me wrong – my family has had its share of dysfunctional moments, its share of fights and traumas, but at the core was always an unwavering belief that there was somewhere I could return to, somewhere I would always be welcome, not matter what. Perhaps this understanding has come from osmosis, or from learning the programming in an unconscious way, perhaps from example, and perhaps from words specifically spoken. It may have also come from intent. It may be from the sheer will of my Mom and Dad (despite their short-comings and misgivings) that their children would know who they were, and where they belonged. I know my Mom in particular, doubted herself as a hostess and social being a lot. I know she was not at ease with having people round, and did not ever feel like she had quite arrived when it came to be showing hospitality. She may have sometimes preferred the idea of family to the actual presence in her house, but it was only because she felt to inadequate compared to the enormously high standard she had in her mind of how family should treat each other. Mind you – she didn’t mean to judge people by her the same high standard she set for herself – she always felt welcomed by the simplest hospitality, revelled in the love of family, no matter how it was presented. My Mom was one of those kind of people who never quite feels they have achieved even the most elementary goals, and despite her huge success in her professional life (I mean one can scarcely be honoured more highly than she was for her lifetime’s work) she always felt like she lacked. She was a ferocious and uncompromising mother, both in the way she taught us, and in the way she protected us, and for her there was no higher goal than to instil and pass on her earthy, generous, and comprehensively inclusive understanding of family. I realise this because of the way I have been able to receive and accept, and in the way I have been offered love, support, and kindnesses from family in a way that I have never quite understood until now. Sometimes we need to be mature enough to receive being “familied”, but we also need to be able to have that basic understanding of what and how family operates in order to be in a position to truly appreciate the extent of love and kindness that is poured out at a time like this. I am so truly blessed and lucky to have been one of those for whom “family” has been so thoroughly modelled, explained, and inculcated, that I know in my “knower” that my Mom loved us all as much and as completely as a human could, in all her imperfect and eccentric ways, and that she also knew in her heart how much loved she was, even if those beliefs didn’t always reach her head. I was trying to do a foiling technique that requires a laminating machine, but decided to try with the iron first in case it didn’t work, since I didn’t have the exact products mentioned on the post (overseas, etc.) Instead of the foil joining onto hte printed image, the foil melted onto my iron and I ended up with a melted mess. After searching for possible solutions, I wanted to try the ones that used only non-scratch alternatives. I tried putting the iron into the freezer to see if the plastic would indeed just “peel off”. It didn’t. Maybe a different type of plastic. Then I tried putting some vinegar onto a cloth and rubbing the iron. Firstly, let me say, I really did think it would just come off since it is what the blogger wrote, but alas, I needed a whole lot of elbow grease and the edge of my nail, but the iron is beautiful and shiny again. Don’t use metal scrapers – you will simply scrape the iron and won’t make any difference. Use vinegar or some alternative gentle acid. You will need to use elbow grease to get the gunk off. You will have to rub it more than just a few times. No matter how short your nails are, you can use them to get tiny blobs of gunk off an iron is you have softened it with vinegar first. Now I am off to try find alternative foiling techniques, although I suspect I just don’t have the right type of foil-y type substance to produce the result. No matter, I will just use a different finish. Having read Melanie’s book on Contemporary Dyecraft, when I heard about this book, I pre-ordered it while it was still in production. I was not disappointed. The thing I like most about Melanie, is her enthusiasm. Only second to this, is her passion to facilitate the bringing together of her world of creative colour, and anyone and everyone who wants to be involved. This also specifically includes those who otherwise may not have had an obvious way in due to lack of exposure, lack of funds, lack of infrastructure, and so on. In this magnificent book, her second title to date, Melanie uses her philosophy of taking what you find in your surroundings to produce stunning results. Even for those like me who may think we are not capable of doing such a thing. Using the most unexpected items to produce the graceful designs; items such as bones, patterned glass bottles, Tupperware lids, and even old cardboard milk cartons; – as well as master-crafted lino prints; Melanie shows 50 elegant and stylish designs that would be at home on any haute-couture runway but are within the reach of anyone. Being a craft book, it has a wealth of technical information about the types of materials you use for the colour (including a chart explaining fabric dye versus fabric paint), finishes, tools, and also other important things like how to clean up, safety, etc. This book is a gem, inspiring creativity and imagination, and shows what you can achieve if you look beyond formal and traditional ideas. Be inspired to create your own one-of-a-kind wearable art using objects you have in YOUR home. The original page by the publisher is here: http://www.metzpress.co.za/books/book-details/50-silk-scarves. I have been wanting to use t-shirt yarn, also known as tarn, for a long time, but haven’t really had the energy or know-how to make it, and didn’t know where to buy it, plus it is not really that cheap anyway. 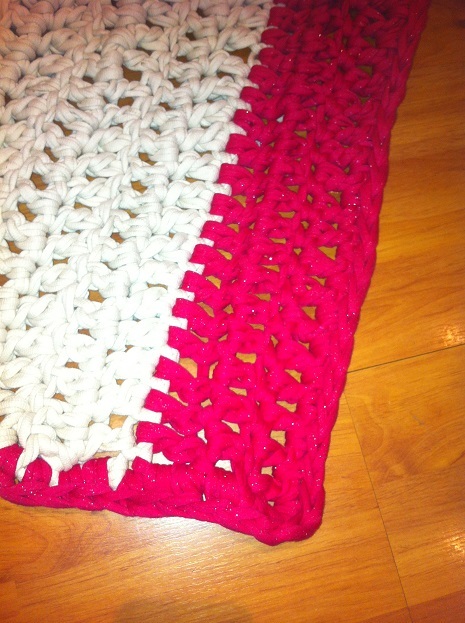 Then I came across two balls, and I made my first project – a bath mat for my folks. They have been wanting a new bath mat for some time. Tarn is perfect because it is absorbent, soft, and totally washable. 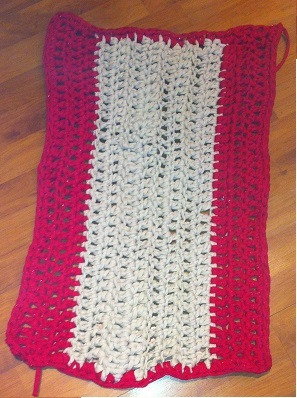 Here is a pic of it fresh off my crochet hook – ends still need to be sewn in. It was made from a pretty reddish colour with sparkles, and a white. You can’t really see the sparkles, but they are really pretty. I make home made cards, and some are actually quite good. I admit, others are, well, not. I have no expectation of any of my cards being kept, or more enjoyed than your store-bought ones, but I do like being able to give one that is specifically made with for an individual. I will respond in a few days with 9 reasons why home made cards are better than store bought ones. It is my opinion that growing up means the amount of sheer poop life throws at you consistently increases. Exponentially. Instead of being able to stomp down, and climb up the proverbial pile of poop to exit the well, it just hits you on the head, goes in your nose and mouth, and blacks out your eyes until you just don’t know which end is up. I mean, it is just not funny any more. In fact, I officially challenge the Cousin – Barry Hilton – to make a set out of my life right now. You’ve heard it all before, I am sure – the well-meant but somehow not-so-helpful: “this too shall pass”, “it is just temporary”, don’t worry, everything will be okay”, “I am sure it is just a phase”; or perhaps the less welcome: “Yes, but I have had the same thing and it all gets easier…”. Blah, blah, blah, vomit. Perhaps the lesson here is to just go ahead and take the best of whatever is available. After all – no one is going to just give it to you – even if it does belong to you. Or perhaps, as witnessed by two of our kitties – Lalee and Nonni. There are enough for a bed per cat, and it used to be that they each only used “their” own one. Nonni, bless her, has decided that whichever bed she is not currently in is the better one. Every night, they seem to switch. Upon closer inspection, I have learned from this that if the thing I want is busy, just get there earlier tomorrow. Just like, kick ball in the early grades. If you are not the first person there, you can’t choose the good ball or the best team mates. Perhaps an added endorsement of this course of action is the way Zippy, our Jack Russel, plays with balls, sticks, ropes, well, anything really. He sees what he wants, asks you to throw it, and then goes and takes it away. He does not bring it back for more throwing, he simply goes and hides the item, never to be seen again. I guess this is a cunning method of preventing others from using your favourite “towel”. On the face of it, this seems to work, except that Nonni, having hidden all her toys to prevent others from playing with them, has now graduated onto catching birds. Not for eating, not for releasing, but for absolutely playing with them until they are dead. It is a sad side of having kitties – they do get hold of all the birds. Especially if their toys have been hidden. Sigh. Ok, so no lesson is perfect, but I think the lesson I will take today is one of hugging. Even though not all the animals want picksy-upses, they do want to be loved, scritched, gently stroked, or just acknowledged with a head boop. Each of them, in their own way, gives me what my friend and her son call “body love”. This can take the form of a full length hug to a simple and comforting pat on the back. Either that, or all animals, and therefore all people, only love the ones who give them the food. Actually, that is the lesson. Always be the one who gives the food. Always.